SAN FRANCISCO -- San Francisco nuns who serve the homeless are in danger of getting kicked out of their home after a rent hike of more than 50 percent. 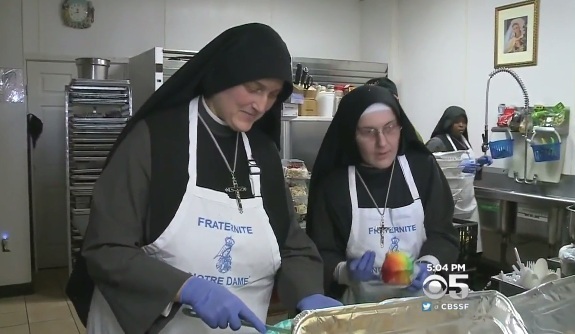 The San Francisco Chronicle reports the sisters of the Fraternite Notre Dame Mary of Nazareth Soup Kitchen can't afford the rent increase from $3,465 to $5,500 a month as of Jan. 15. Their lawyer says the owner has served a notice on the nuns asking them to pay the higher rate or leave. That's the going rate now in the Tenderloin, CBS San Francisco reports. "But you have to think to the other people. The people who are suffering and struggling on the street," said Sister Mary Benedict. "You have to make money, you can make money, but you have to help the poor people. So you have to find the right balance." An attorney for the landlord, Nick Patel, says his client is in India and has put everything on hold and will assess the situation when he returns later this week. The soup kitchen is in one of San Francisco's poorest neighborhoods and feeds hundreds every week. "I don't know what I'd do without them," said neighborhood resident Princess Johnson to CBS SF. "They're just so nice. And they cook free food for the homeless."